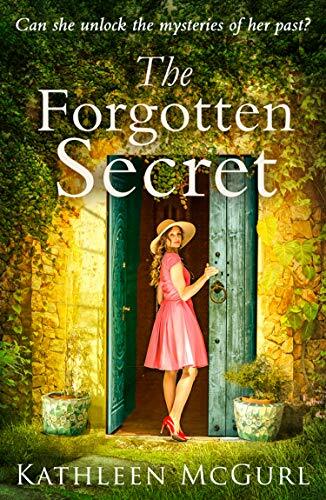 In The Forgotten Secret by Kathleen McGurl, Clare Farrell is approaching her 50th birthday. For half of her life she has been married to a narcissistic man who has systematically cut her off from everything and everyone that did not center around him. So when Clare inherits her uncle’s home in Ireland along with a monetary inheritance, she decides to take the leap and separate from her husband and begin life anew. The house holds secrets, including a stash of guns and weapons under a floor in the barn and a birth certificate and communion medallion from two separate people tucked away in the stuffing of an old armchair. Watch the book review below or skip beneath it to read the rest of the review. I rooted for Clare. I cheered for her, cried with her and laughed with her. Breaking away would not be easy and she encounters events such as wrecking her automobile on an Irish country road to renovating a centuries-old home that has fallen into disrepair. But she makes friends in the nearby village and she exhibits a lot of grit, determination and courage. In between Clare’s chapters, we learn of a woman connected to the house a century earlier during the Irish War for Independence. Ellen O’Brien lives with her crotchety father in a modest home but she’s dating Jimmy Gallagher, a young man she’s known an entire lifetime. They were best friends in school and now they’ve become lovers as well as clandestine members of the Irish underground volunteers fighting for independence from Great Britain. It is Jimmy who grew up in the house that Clare inherits and it’s both Jimmy’s story and Ellen’s that rolls out through the book. The author, Kathleen McGurl, describes the countryside so well that I could see the village in my mind’s eye, both as it was in 1920 as well as present day. I came to respect the danger that Ellen, Jimmy and others willingly undertook to fight for their cause—a cause that would cost some their lives. And when Ellen discovers she is pregnant yet she is still unmarried, I felt her anguish at being sent to one of the Magdalene Laundries, a convent for unwed mothers and their babies that turned into an unsaintly prison. We also see the contrasts in what women could accomplish within a brief hundred years—at Ellen’s dependency on her father and the kindness of strangers to Clare’s struggle for independence. Like all of McGurl’s books, there are multiple threads that seem unrelated but all blend together into a seamless mosaic of love and war, endings and new beginnings. I highly recommend The Forgotten Secret by Kathleen McGurl.